This Simpson MSH3125-S Megashot pressure washer is a grade above the average gasoline-powered residential class power washer commonly purchased for personal use. 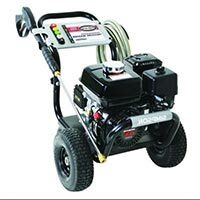 This premium grade pressure washer brings a powerful 3100 PSI to your cleaning projects. With the Simpson MSH3125-S, you can power through those tough cleaning jobs, whether you’re using it for a do-it-yourself home project or you need some industrial cleaning at your business location. If what you need is a versatile pressure washer that can tackle all sorts of cleaning jobs, the Simpson MSH3125-S may be just the thing you’ve been looking for. One thing that makes this Simpson MegaShot MSH3125-S perfect for home and business use is its lightweight design. This also adds to the maneuverability of the pressure washer. The balanced wheels in the design make it easy to move around. The unit is powered by a premium Honda engine which is built to start easily. This engine also produces less noise than you would normally expect from a gasoline-powered engine. The Simpson Megashot’s PowerBoost axial cam pump increases the performance while reducing the vibration, heat and noise of the pressure washer. The hose is resistant to kinks, making your cleaning go along much more smoothly. To help prolong its life and to keep it looking great, the hose is also resistant to abrasions. This feature decreases the chance for holes and leaks to develop. The poly-braided hose won’t mar the surface of your decks or patios with scuff marks. Any user will find this unit easy to operate with its quick connect spray wand and nozzle. Even those just learning how to clean with a pressure washer can use the pro-style wand and nozzle with confidence. The hose connects with easy connectors to shorten your preparation and assembly time before you can get to work. 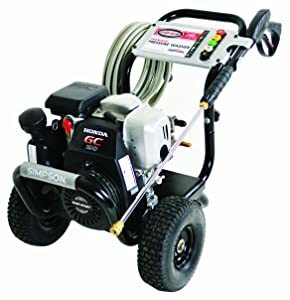 Though there are some reported drawbacks that may give some pause, this Simpson MSH3125-S MegaShot gasoline-powered pressure washer is unique and holds its own with some of the best brands in the market. It is efficient and easy to use, maneuverable and durable. It will fit the needs for just about any cleaning task around the home or the shop. It is a compact pressure washer with the power and flexibility needed for just about any job.